10 DAYS. 4 RUNS. JOIN THE CHALLENGE! Connect to the challenge through devices like fitbit, mapmyfitness, RunKeeper, JAWBONE, Garmin, Strava, etc. Once you've signed up and the challenge begins, your device will automatically upload your workouts. A real-time leaderboard will reflect the current rank of each store, as well as top individuals. Click the Join Challenge button for your city below. Connect your favorite fitness tracking platform. Log 4 runs runs between April 25-May 4th and you’ll claim your challenge badge, plus be entered in to win more prizes! Any run or walk activity will count toward the challenge. No specific distance or time required. Log four runs within the 10-day challenge dates and receive your custom Fleet Feet Running Club challenge badge starting Friday May 4 (available for pick up at your registered Fleet Feet store). *Bonus: The first 10 people to claim their badge at their store will receive a $20 store voucher good toward any Saucony footwear (*Subject to store participation). The top Fleet Feet store in the country to log the most cumulative miles during the 10-day challenge dates will win 20 $50 Fleet Feet x Saucony vouchers to award to participants (*Miles divided by # of total participants. Vouchers awarded first-come, first-serve at store discretion). 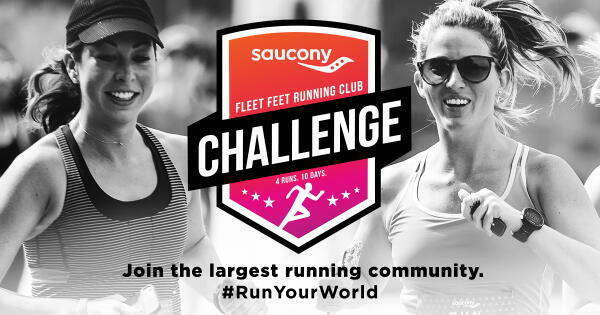 The top Fleet Feet store with the most participants signed up for the challenge by the end of the 10-day challenge dates will win 20 $50 Fleet Feet x Saucony vouchers to award to participants (*Vouchers awarded first-come, first-serve and at store discretion).